A Yellow Jacket clearing snow Downcity. January 21, 2012. Have you lived in New England for more than a year or so? Remember how last year it snowed, and the year before that it snowed, and for 10,000 years before that it snowed? Well, get ready, all the weather people seem to agree, it is going to snow again Saturday. So, you might want to remember how to deal with it. The City luckily, has you covered. When snow season arrives, City crews, residents and businesses need to work together to manage challenging winter weather conditions. The Providence Public Works Department is responsible for clearing snow and ice on more than 421 miles of City-maintained roads in the City of Providence. Over 130 pieces of equipment are available for every storm, including plows, tractors, snow blowers, graders, loaders and pickup trucks. Materials and equipment are housed at one central location in Providence. Public Works replenishes supplies after every storm. The first priority for city crews during and immediately after a snowfall is to clear priority roads, including major arterial streets, bus routes, bus stops, and roads that access fire stations and hospitals. The second priority is to clear collector streets and routes leading to schools. Once conditions have been stabilized on first- and second-priority routes, crews will begin to clear local streets. Local streets are not plowed immediately during a snow event. In the event of continual snowfall, it may take longer than usual for plows to reach local streets as first- and second-priority streets will require additional attention. Also, don’t forget to share you snow photos in our Flickr Group, we might share them here on the site. 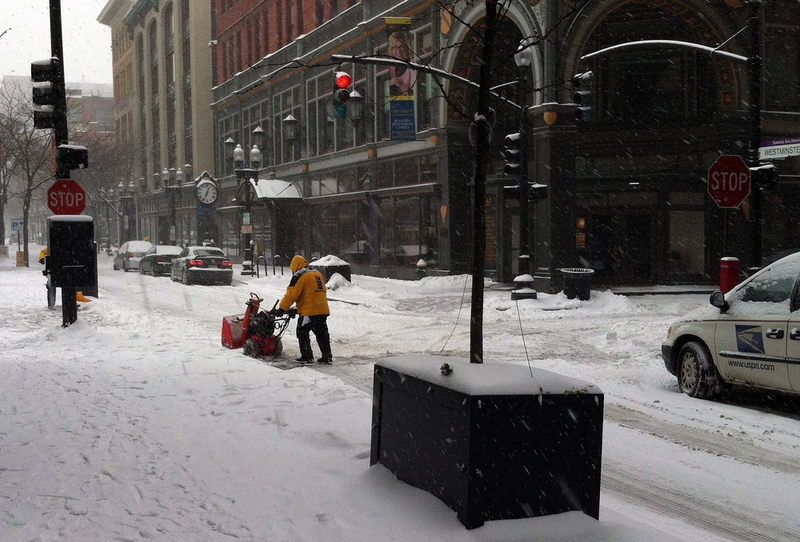 What are your legal requirements as a citizen of Providence when it comes to snow removal? Sec. 23-13. – Removal of snow — Required. Any person found guilty of violating this section shall be fined not less than twenty-five dollars ($25.00) nor more than five hundred dollars ($500.00). The enforcement of the above shall be done by the city police department and/or an inspector or supervisor of the city public works department. Failure to pay the fine within thirty (30) days will result in the creation of a special lien against the said lot(s), which lien shall be removed only upon payment of the fine plus an administrative penalty of one hundred dollars ($100.00). The imposition of such fine and other charges may be appealed to municipal court within ten (10) days of the issuance of a written citation. Sec. 23-14. – Same—Deposit restricted. Snow removed as provided in section 23-13 or from any lot shall not be thrown or deposited on any portion of a street, highway or public place which has theretofore been plowed or cleared of snow, provided that the director of public works may whenever public convenience or necessity, or physical conditions so require or extreme hardship may result, modify the provisions hereof. Any person found guilty of violating this section shall be fined not less than twenty-five dollars ($25.00) nor more than five hundred dollars ($500.00). The enforcement of the above shall be done by the city police department and/or an inspector or supervisor of the city public works department. The imposition of such fine and other charges may be appealed to municipal court within ten (10) days of the issuance of a written citation. Sec. 23-15. – Depositing snow on highway. No owner, lessee or occupant of any premises, any person cleaning or removing snow there from, shall deposit or cause to be deposited any snow from said premises upon any highway except with the permission of the director of public works. Sec. 23-16. – Removal of ice from sidewalks, required. Whenever the sidewalk or any part thereof adjoining any building or lot of land on any street shall be encumbered with ice, it shall be the duty of the owner, occupant or any person having the care of such building or lot, to cause such sidewalk to be made safe and convenient by removing the ice therefrom, or by covering the same with sand or some other suitable substance. Sec. 23-17. – Removal of snow and ice on sidewalks adjoining city property. Sidewalks adjoining property belonging to or occupied by the city shall be cleared of snow under the direction of the department, committee or officer of the city having by ordinance or statute the care, custody or use of such property. Whenever the sidewalk or any part thereof adjoining any property belonging to or occupied by the city shall be encumbered with ice, the department, committee or officer of the city having by ordinance or statute the care, custody or use of such property, shall cause such sidewalk to be made safe and convenient by removing the ice therefrom or by covering the same with sand or some other suitable substance. The expense of any such work shall be paid from the appropriation for the support of such department. In case any such department, committee or officer has no janitors or employees available to do said work, the superintendent of public buildings may, upon request of such department, committee or officer, cause said work to be done, the expense thereof to be charged to the appropriation for such department, committee or officer. Have you found a sidewalk that someone has failed to clear? Report it to the City through ProvConnex. Be nice if the city actually ENFORCED the laws on snow removal. But they don’t – I recall mentioning this to former mayor Cicilline and he told me that a lot of the properties were owned by elderly folks who couldn’t do it. So I asked why have the law on the books. No answer to that one. And this white death from the sky prediction for Saturday – a whole INCH of snow. It’ll all be gone by mid Sunday morning. No need to shovel it or plow it. You made a forecast before Sandy, I think I’ll listen to the professional meteorologists. If you’re unable to shovel, give a neighbor kid $20 to do it for you, or perhaps the city could have a program where they shovel out old folks who can’t afford to pay someone. I’m from Fargo, ND (read: snows every day for five months), and there are never un-shoveled sidewalks. It’s not this impossible task that Rhode Islanders seem to make it out to be, and the fact that people keep getting hit by cars and dying should really make this a higher priority. But I say this every year. @gcpvd hey Jef, is there anywhere offstreet near federal hill that i could park overnight and not worry about a ticket? Does anyone have any leads in their neighborhoods? As the proud new owner of a corner lot, I really wish that the plow operators could push their snow loads somewhere other than the pedestrian ramps at corners that I’m required to keep clear. Perhaps that third to half a lane that they didn’t plow for the rest of the length of the street? This is something the Bicycle and Pedestrian Advisory Commission has been attempting to address with Providence EMA (who are responsible for coordinating snow removal). It has been suggested that plow operators attempt to deposit their snow load in the last 20 feet to the corner, where parking is prohibited rather than all the time dumping it right on the sidewalk ramps at the corner, which blocks the sidewalk, and also blocks the sight-line for drivers entering an intersection. Educating PEMA on these issues has not been without frustration. I saw you ask a question on twitter about where to park on Federal Hill during a parking ban… what was the answer? Do other cities that have many residents purchase parking permits have outright bans with no street parking or do they just do opposite side parking? I’m sure if you parked in most off street lots, you would be towed. I’m far from positive but I believe New York does alternate side parking all year, and that is how they address snow removal. Boston has snow emergency route where parking is banned during storms. Side streets I think are generally cleared by parkers, the city plows around parked cars. During extreme events, the City signs streets telling people to remove their cars for a certain time for snow removal. Portland, Maine issues citywide parking bans, but they have municipal garages for parking. People who live off the peninsula (where there aren’t any garages) tend to live in homes with driveways. The peninsula is the only really urban part of the city. I remember one giant storm in Portland when we were stacking cars in the alley beside our house which was not actually a driveway, but served as off-street parking in a pinch during a storm. The shoveling out and removing the cars the next day was the hard part. In Newport, the only streets that are required to be clear during or following a snow storm are major streets that are posted with snow emergency signs, such as Broadway, Thames, Spring, Bellevue, Touro, Kay, Memorial Blvd, etc. Not only downtown, but all side streets, even in more suburban-like parts of the city have parked cars on the streets that stay put during and after a storm. A very limited number of residents of the Point neighborhood will use the only municipal garage that’s nearby for the convenience on not being buried by snow. If anyone leaves their car in a private or city parking lot, it gets towed. In all five boroughs of New York, the same is true. Parking is prohibited during and after a snow storm on major avenues and major crosstown streets that are posted with snow emergency signs. Major streets and avenues that lack snow emergency signs usually have a period during the day where parking is prohibited and thats when they get cleared. Also immediately following a storm parking meter rules stay in effect. All side streets have parked cars on them that stay in place during and after storms. Alternate side of the street parking rules are suspended, sometimes for weeks, until the snow melts. I don’t know what New Haven or Worcester does about this issue. Providence officials should check to find out how other large cities deal with snow and on-street parking. Traditionally Pawtucket had(s) factory parking lots where people would put their cars. I wouldn’t classify Pawtucket as a large city. Even the more urban parts of Cranston are really suburban and bad examples for Providence. Providence used to do something different, there are ancient “snow emergency route” signs scattered throughout the city which indicates something similar to Boston’s way of handling things. Those snow emergency routes in Providence don’t seem to mean anything anymore as the City now simply imposes a blanket city-wide parking ban when there is a snow emergency. Does anyone know what those “snow emergency route” signs used to indicate?